A while back I shared a bit about my love-hate relationship with Christmas. Y’all, It can’t be a total mystery that there’s a spike in the common stress level from the mid- November through the end of the year. I don’t wanna beat a dead camel but truth is, you don’t have to be a genius or a Christian to see much of what gets the most attention during this “most wonderful time of the year”, has absolutely nothing to do with the “Reason” for the season. But that’s not what this post is about. AND while I can neither confirm nor deny that the “Elf on a Shelf” is an agent of satan Santa (just kidding people), this is also not what this post is about. A few years ago, I joined my friend Katherine for a week of Christmas spotlighting her Advent devotional. Then I told you about one of our favorite family traditions; baby Jesus in our stocking. I sat on my couch looking at the nearly-naked tree a few nights ago and I guess I was still long enough for it to catch up with me: it’s almost over. The years of lego-strewn floors and the excited (or not) squeals of knee-knockers running through the house…hormone-laden “expressions” coupled with other loud and exasperated “exchanges”….the years of scraping together what little we had to place what always seemed like way too much under the tree. We’ve turned the corner into new territory. So…for a night, I was a little sad. I’m ok now… it’s how it should be…even if it stings. We’ve done our “job” of setting TRUE Christmas before each of them, and now it’s time to stand back and watch the Truth take hold in their individual lives and bear it’s own glorious fruit. However, a few of these more precious thoughts have kept me pondering in deeper waters over why we celebrate at all, the meaning behind the traditions we may choose to keep and what happens when there’s no one there to observe them with you. I sat with my husband that night, so grateful for the space he gave me to spill the words, thoughts and tears all running together into his lap. Together we worked to sort them into little piles of “truth and not-truth” and then scraped away what didn’t belong. What can it mean otherwise? Why put up a tree, light a candle, set a creche or hang a dang thing? It struck deep; if what we do isn’t anchored to the heart of Christmas, and is instead tied to superficial things or even the presence of others, we’ll eventually find ourselves adrift and slightly lost on dark waters when (not if) things change. What is this heart of Christmas? What are we anchoring ourselves to? Honestly, I missed it for years. I think it’s what most perplexes the unbelieving (and yet somehow still celebrating) world around us. God gives us the answer through the answer He’s been giving ever since that night when, with no room in the Inn, the virgin Mary gave birth to her firstborn Son with Joseph by her side. Wrapping him in swaddling clothes they placed Him in the manger and named Him “Jesus”. Yet, even this is not the heart of Christmas. Certainly it’s a most miraculous part of it, but the fact is, Jesus, the Son of God, was only one of maybe hundreds…or thousands of babies born that night. The heart of Christmas is anchored in the WHY of His coming ,which was not simply to be born so miraculously, so magnificently…but to die, saving those who believe and bridging the gap between us and God. The heart of Christmas is found anchored three days past His sacrifice at the cross….at the stone-rolled-away, He-is-not-here, He has risen, empty tomb. THIS is why we celebrate Christmas. THIS is why we can have hope . No matter what else is going on. This GLORIOUS truth, their obedience and telling is why we know, can and must still tell today. 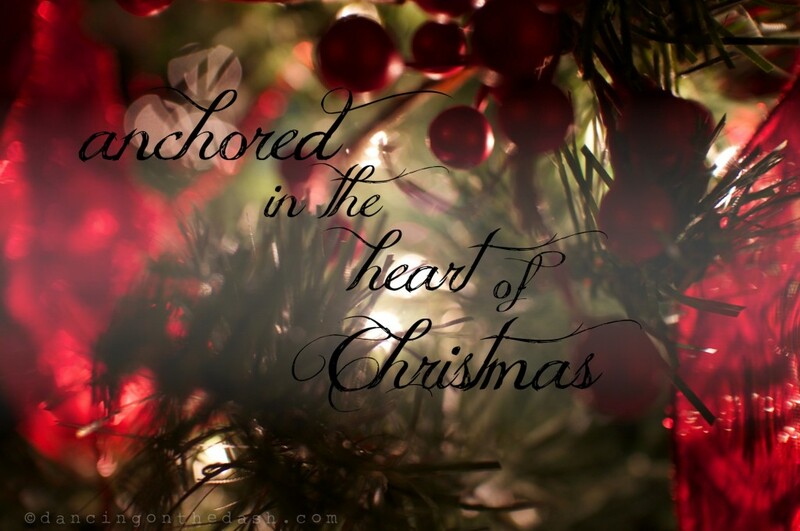 Anchored in the heart of Christmas, we must consistently live and tell the whole story…the story of His coming, the story of WHY He came and what He did…and then, most importantly, we must live believing and telling of how Jesus is coming again. 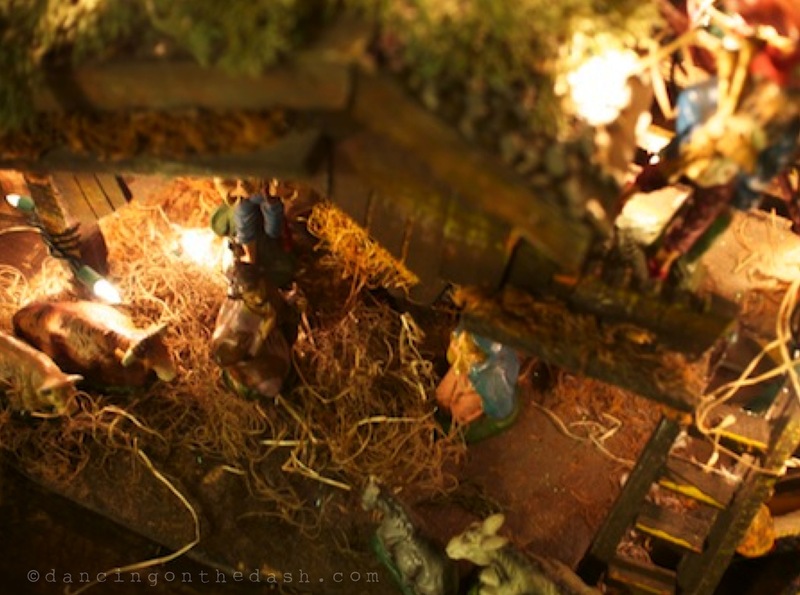 Oh come to the manger and let us adore Him, Emmanuel–God with us. Pause, remember and celebrate His life on earth but don’t stay there—that’s only half way home. Because Jesus didn’t come for a season. Oh no. He came for all eternity and that is why we can celebrate. We are a people who once walked in darkness, who’ve now seen this Great Light. I have been chewing on it since I read it. Thank you for this post. Best wishes for 2014 and all the Lord and you will do in partnership as you allow His good hand to continue to move in your heart and life, Loretta. Thank so much for giving me this link. I am so glad to know you now as YOU, not just Chelsea’s mom! Many blessings. “Bridging the gap between us and God”. So profound. So awesome. Words are superfluous! wonderfully stated! We all, believers and non believers, need this truth. The beauty of Christ is missed without the pain he endured 33 years later, as He cried out it is finished and gave the world true hope! I Can not imagine life if Jesus did not die, in His death he bought my freedom. Thanks for the wonderful reminder. God knew. God knows. We’d like to think we could get by without having to go there but we can’t and we shouldn’t be bitter or sad when it comes…because Emmanuel has come and He is still with us. We have to press through and open ourselves up as offerings. I’m learning how to handle that day by day….and grateful I get to do it with folks like you. Merry Christmas! Yes indeed Jim! As a matter of fact, the one who isn’t coming home for Christmas and instead went to her boyfriend’s family in Iowa called last night with their “announcement”! Seems like this time next year, we will be welcoming another son into the family and this is as it should be. Merry Christmas to both of you! Lorretta, your words are so amazing! I simply love your writing! Love your heartfelt sincerity! There are probably so many of us who could open ourselves up to what we really feel, believe about Christmas, yet go through all the motions. I feel like it might just take us years to realize the truth of the matter. The internet has given us so much to prepare our hearts this year for the real meaning of Christmas! Thankyou for sharing your personal epiphany Lorretta! You are so precious! Oh Helen…your encouragements are sweet to my soul today. As you know, it’s very difficult to say things as they are…very unpopular as we are discovering more and more every day. I know this time of year….as with any other, I’m afraid, brings painful reminders regarding more of what’s been lost versus what through Christ we have found. I understand that. As I read this morning in Ann Voskamp’s lovely advent Devotional, “The Greatest Gift”….no matter what, eventually we will lose everyone and everything we love here on earth. What people fail to hold on to is the answer…the hope that all is not lost with Christ. Merry Christmas dear Helen! So so grateful He makes it all okay! Thank you Caroline…honestly, when I finally was able to see the manger moment with eyes wide open, the joy of Christmas really took root in my soul. I pray the same is true for you. Merry Christmas!